The updated Apple Watch is expected to be launched at the iPhone XS event on September 12. The biggest change that will feature on the Apple Watch Series 4 is that it will have 15 per cent larger displays for both sizes. A report had recently surfaced showing off the first official image of the next generation iPhone which upon launch will be called the iPhone XS. 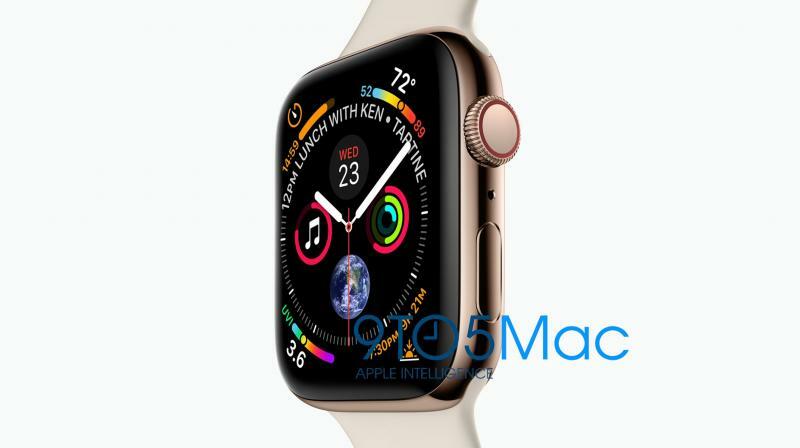 9to5Mac has also got an official render of the next-generation Apple Watch and from the looks of it, this new model will also have the new gold colour the upcoming iPhone XS will sport. As per the report, the biggest change that will feature on the Apple Watch Series 4 is that it will have 15 per cent larger displays for both sizes. This has been achieved by Apple managing to reduce the size of the bezels without increasing the overall size of the smartwatch. The report states that there will also be a new watch face that’s capable of displaying more information that is currently offered on the Apple Watch. From this leaked image we can see that the new watch face shows a total of eight complications around the time and within the clock hands. The report goes on to add that there is a likelihood that Apple has designed a few more watch faces that take advantage of the larger display. Apart from this, the Digital Crown and the side button seem to be modified and there is a new hole in between them that could be for another microphone.